Echo videos can be embedded in a Canvas course page or website for easy viewing. Note: If the video is a scheduled recording, instructors will need to contact ELO for help or admin permission to embed the video. Go to https://echo360.org/ and login. 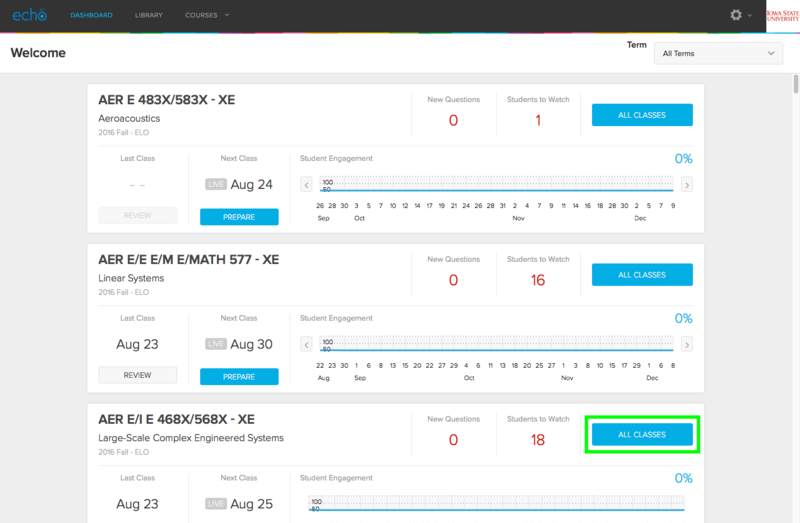 After logging in, select ALL CLASSES next to the course containing videos to be embedded. 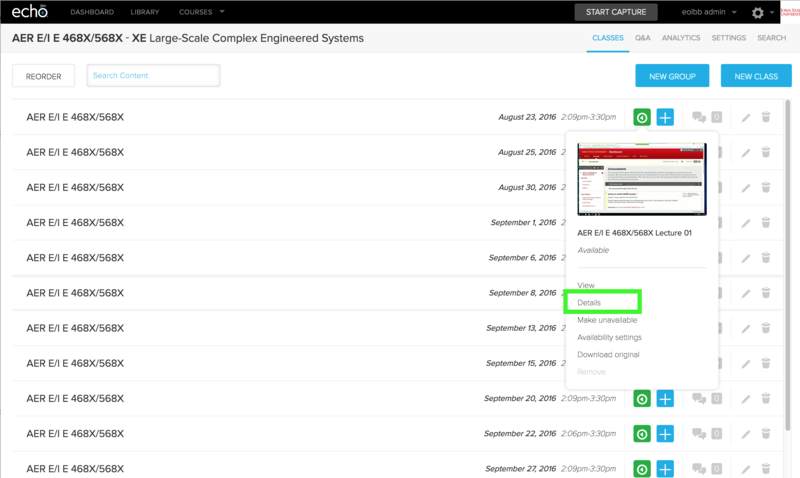 In the classes page, choose the video to be embedded by clicking on the green play button and selecting DETAILS. The capture viewing pane will appear. Below the capture viewing plane, click the SHARING tab. 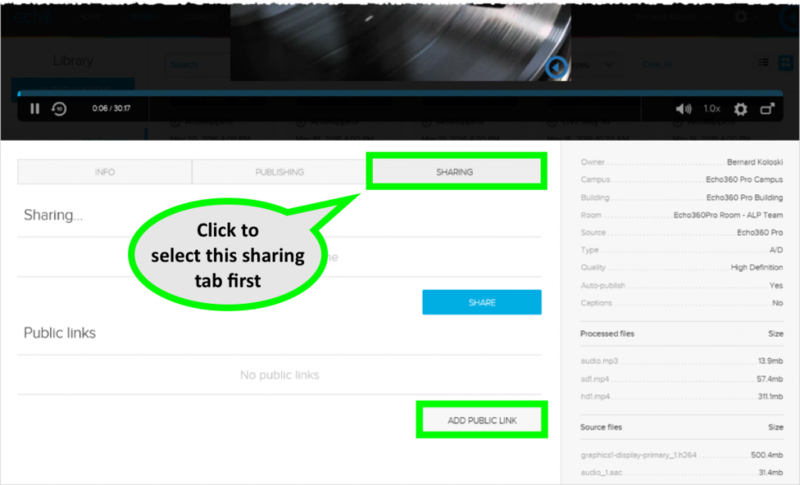 In the Public links section, if a public link has not been generated already, click ADD PUBLIC LINK. Active slider: When enabled, clicking the link plays the linked content. If disabled, the link URL itself remains valid but users clicking the link cannot view the content. Delete: Permanently deletes the URL and its relationship with the content. If the URL remains posted publicly, clicking it will return a content not found error, as there is no longer any association between the URL and the content. Future public links to this content will have a different ID number in the URL. Description: Enter a description for the link. This is useful for identifying the purpose of the link or the location to which it is to be posted. Start at slider: When enabled, allows you to set a ‘starting location’ for the content. Users can view the entirety of the video, but by default the video begins playing gat the location you set. 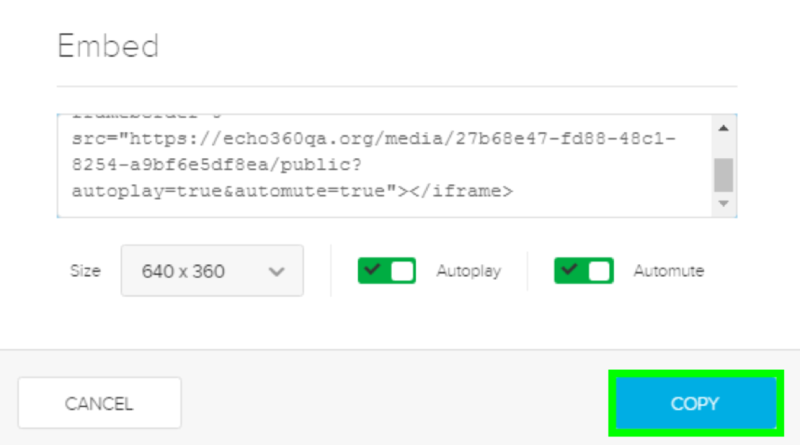 Authenticate slider: When enabled, requires users to log in to Echo360 to view the linked content. If users are authenticated through an LMS or SSO system, and the user is already authenticated as an Echo360 user in their browser (for example, the user recently viewed an Echo360 section) the user will be automatically passed through. Size drop-down: Select the size (height and width) of the embedded video playback. For bandwidth considerations of the viewer, select the smallest size reasonable for the type of content being posted. Autoplay slider: When enabled, the content automatically begins playing when the link is accessed. Automute slider: Only available if Autoplay is enabled; automatically mutes the video on playback. Users can un-mute the content as needed. COPY: When clicked, copies the embed code shown in the text box to your clipboard, for pasting to an appropriate location. Click Cancel to close the Embed modal. When finished, go to the necessary Canvas page to embed the video using the HTML editor. This can be added into any Canvas course page by pasting the Echo HTML content.